As far back as memory reaches, musicians have travelled widely to enjoy each other’s music and learn new techniques. While politicians carved up Europe, composers forged the sound of an ever closer union. Franco-Flemish polyphony was heard across the continent, Italian Renaissance counterpoint carried across the Alps, and British madrigals migrated across the Channel. The resulting process of mutual musical enlightenment wasn’t only geographical but temporal too, with modern composers building on their ancestors’ achievements. In a summer dominated politically by Britain’s Brexit, Orlando Chamber Choir travels from London to Bruges with a programme of European choral music. 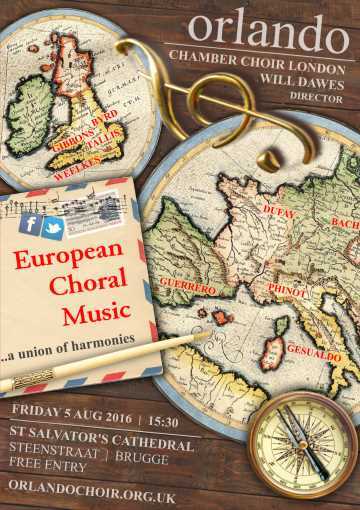 Come and listen to the sound of Europe’s musical melting pot!